OLYMPIA, Wash. – The situation is pretty simple for the Oly Town Artesians (2-4-0, 6 points): one win combined with one loss by the Arlington Aviators and the Artesians are in the Western Indoor Soccer League playoffs. And if Oly can pull off the road win on Saturday over the Wenatchee Fire (2-3-1, 7 points), Oly can move into third place with just one league game left to play for both teams. 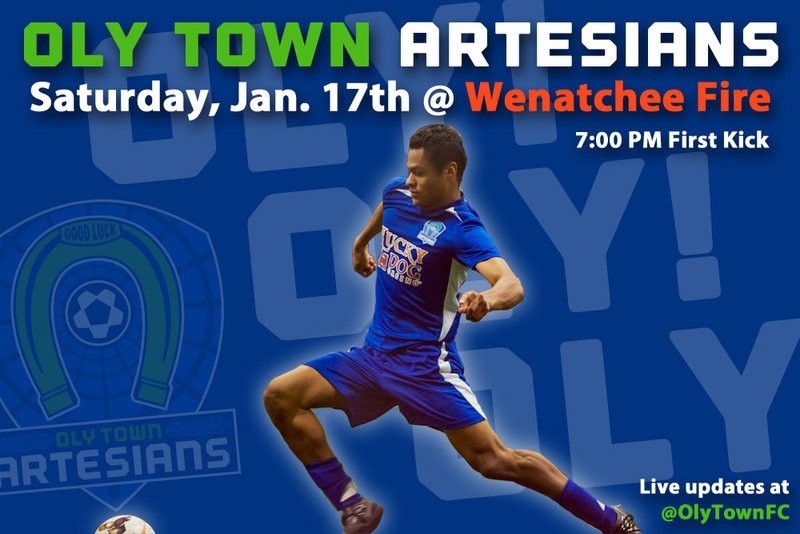 It will not be an easy task for the Artesians when they kick off at 7:00 PM in Wenatchee. The Wenatchee Valley Sportsplex is a notoriously difficult place to play for road teams and the Fire are 1-1-1 at home this season with a win over Arlington, a loss to first place Tacoma and a last second draw against second place Bellingham. The Artesians are 1-2-0 on the road this season. Their only win away from home came in the dying seconds of the game against Arlington when a Matt Stalnik goal with just 12 seconds left completed a fourth quarter comeback and gave them a 7-6 victory. The Fire are led by the reigning WISL Player of the Week, Adrian Espinoza. He scored four goals on the road in a 12-7 loss to Bellingham last Saturday and is now tied with Oly Town’s Willie Spurr for second in the WISL with eight goals scored. Derek Johnson of the Tacoma Stars leads the league with 12. The Fire have scored 40 goals this season, three more than the Artesians, with Juan Barboza, Josh Alvarez, Matthew Stefanko and Hernan Mendoza each collecting four goals in league play. The two teams met on December 6th at Olympia Indoor Soccer in a hotly contested match that saw the Fire try to mount a fourth quarter comeback that ultimately fell short giving the Artesians their first win in franchise history, 10-8. Stalnik led the Artesians with a hat trick and Nate Salveson and Greg Wolfe each recorded a brace in the win while Wenatchee got single goals from eight different players. The Fire will not have to contend with Stalnik in this game, though. He was injured against Arlington and is out for the season with an ACL tear. The Artesians continue to shuffle their roster trying to find the right mix to halt their three game skid. They will feature a couple of new players including JC Henson, a casualty of the professional MASL Seattle Impact FC’s failure and folding. Henson scored four goals and had four assists in twelve games with the Impact. Fans can follow along with the action from Wenatchee by following the Artesians on Twitter at @OlyTownFC or by liking their Facebook page at Facebook.com/OlyTownFC. The Artesians return to Olympia Indoor Soccer on Saturday, January 24th with a friendly against the Oly Indoor All-Stars at 6:00 PM before returning to league play with their regular season and home finale against the Arlington Aviators on Saturday, January 31st at 6:00 PM. Advance tickets for both games can be purchased at http://www.olytownfc.com.